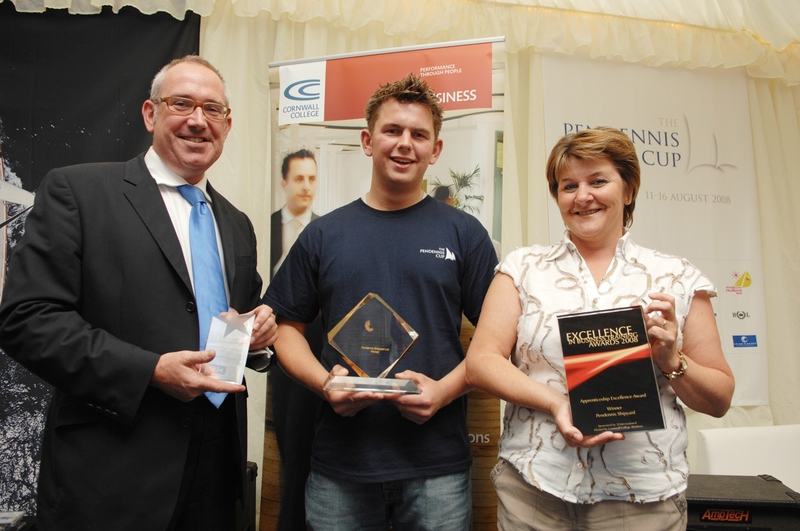 A trio of awards for Pendennis. Cornwall College Principal John Latham with Pendennis apprentice Chris Pollard and Pendennis training director, Jill Carr. Cornwall College Business (CCB) hosted a celebration event in honour of Pendennis Shipyard Ltd’s recent win at the annual national apprenticeship awards ceremony, this week. Pendennis Shipyard beat off competition from British Gas and BT to be named ‘Large employer of the year 2008’ in recognition of their outstanding apprenticeship scheme. As Pendennis’ partner in the scheme, CCB brought together Pendennis apprentices, employees and directors, along with tutors and staff from Cornwall College Business in recognition of the hard work of all involved. The scheme at Pendennis, which has been running for 10 years, sees apprentices work in the world class shipyard in Falmouth and spending their at college consolidating their knowledge with experienced tutors. The results being that they have gained both qualifications and experience while earning. Apprentice Chris Pollard, from Falmouth, explained during an impromptu speech at the event why the apprenticeship is so important to him; “Being able to work and learn while I’m earning money is excellent. It’s more practical and I know it’s setting me up for a good job in the future. I want to thank everyone at Pendennis, especially Jill Carr, Pendennis Training Manager, and all at Cornwall College who has helped me on the scheme”. Also speaking at the event, Cornwall College Principal John Latham said; “I’m so pleased that I have the opportunity to congratulate Pendennis on achieving this award, their dedication to developing local skilled people is truly noteworthy. The significance of apprenticeships is growing on a national scale due to their relevant and practical nature, and I am delighted that a company from Cornwall is recognised as an example for the whole of the UK”. Individuals and businesses who are interested in Apprenticeships and want to find out how an apprenticeship can benefit them, can get further information at www.ccb.cornwall.ac.uk or by calling 0800 731 7594.